David and Naomi were both raised in Christian homes. They spent time overseas as missionary children and have both grown with a desire to serve in missions. In 1997 David commenced his apprenticeship as an Aircraft Engineer with MAF, spending three years in Ballarat before moving to Arnhem Land to complete his training. Naomi completed her Nursing degree and worked as a Registered Nurse before David and Naomi were married in September 2000. They then continued work with MAF in Arnhem Land. After a short absence from MAF, they rejoined and commenced service in Mareeba before returning to Arnhem Land where David was the Chief Engineer for the last four years, managing the maintenance on aircraft that support Aboriginal Communities. 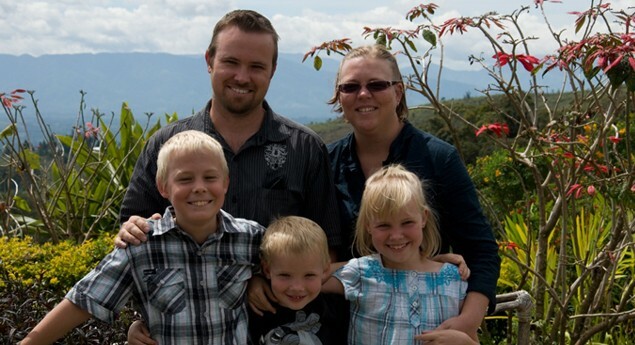 In 2011 the family moved to Mount Hagen in Papua New Guinea, where David continues to manage the maintenance of MAF’s Aircraft. David, Naomi, Mikayla, Caleb and Izak are excited about the opportunity to live and work within a cross cultural setting, serving God and the people of PNG and assisting to bring relief and development to remote people in Jesus’ name.